It would be tough for it to top the 13x30RR! My guess is 1933 wins by about $100K! I'm tipping the original will likely leave the RR for dust. Some of those really early ones are just striking. 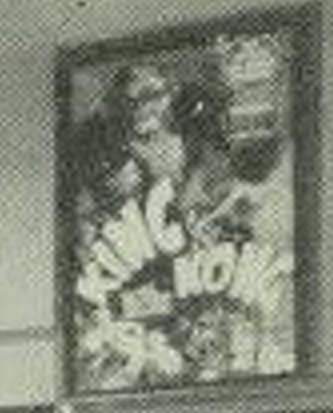 1953 RR artwork, then take into account the above daybill isn't Simmons artwork and the following are Simmons RKO daybill poster images from the same period. My money's on the original 1933 daybill artwork to be the standout, if only for the likely colour. A couple of missing MGM daybills of lesser fame are worth a mention here as well. 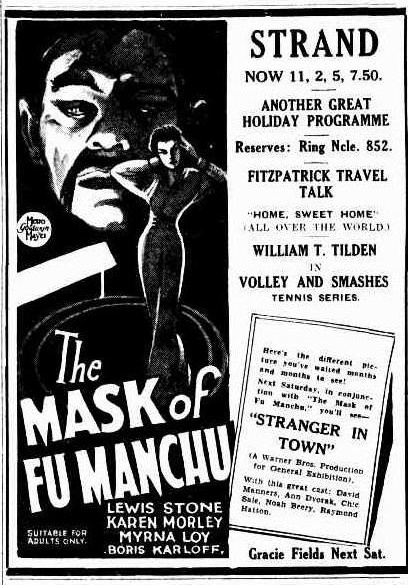 I have always thought the original long daybill of The Mask Of Fu Manchu ( 1932 ) would have to have been a cracker.Looking at the Australian trade advertisement and the original U.S. insert, it makes one eager to one day see a copy of the daybill artwork. 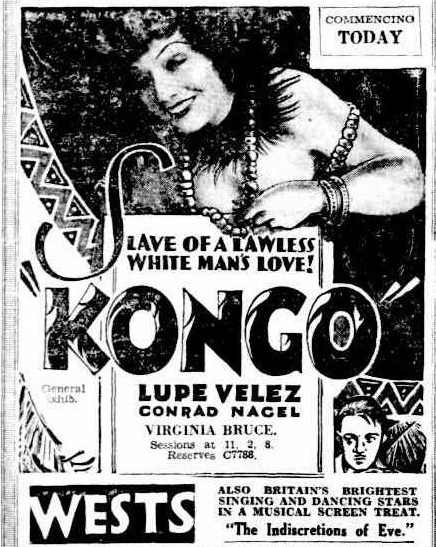 Kongo ( 1932 ) Australian Trade advertisement from 1933 and a rare piece of U.S. advertising material for the film, which apart from some lobby cards and b&w stills, larger posters appear to be almost non existent. 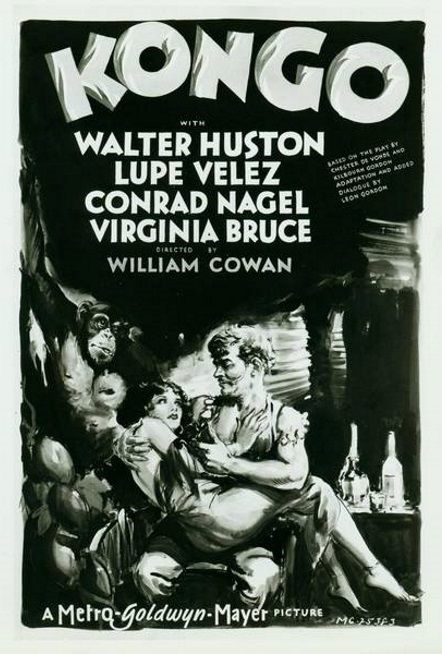 You will notice on the Australian trade ad Walter Huston's name doesn't appear. A rare herald used in Bombay below should, along with the other two images, give us an idea of what could have appeared on the long daybill. 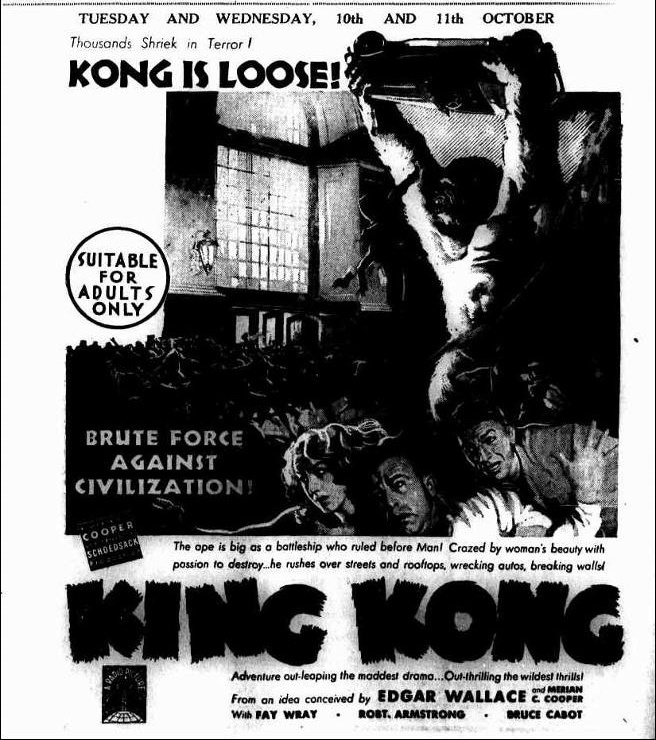 If only the original King Kong daybill would have had this scene appearing on it, as shown here on an original release Australian newspaper advertisement. . 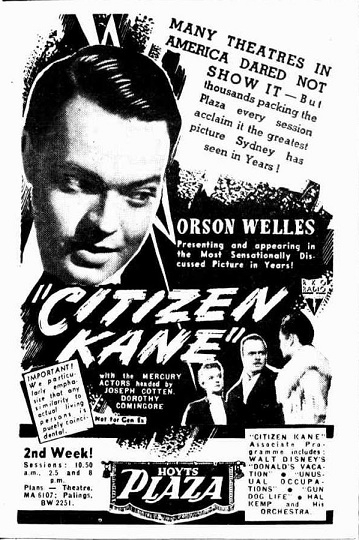 Anyone ever spotted any Aussie paper for Citizen Kane (other than the RR)? 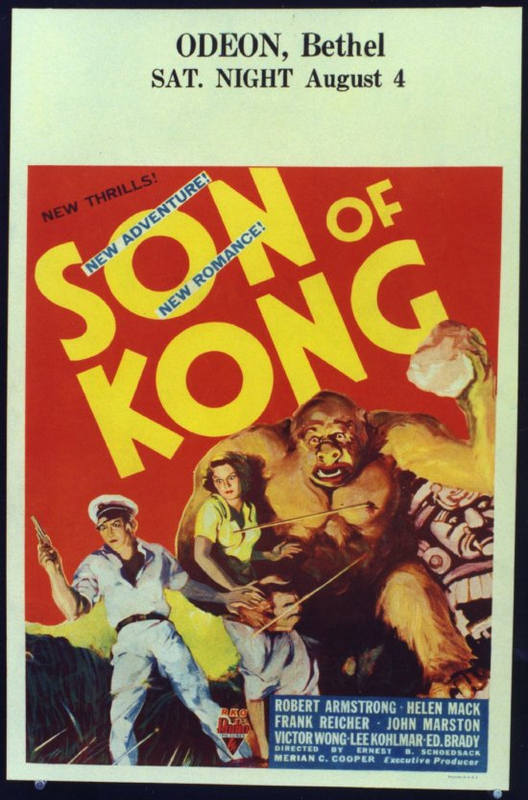 Son Of Kong ( 1933 ). Any first release material is extremely hard. if seeming impossible, to locate. 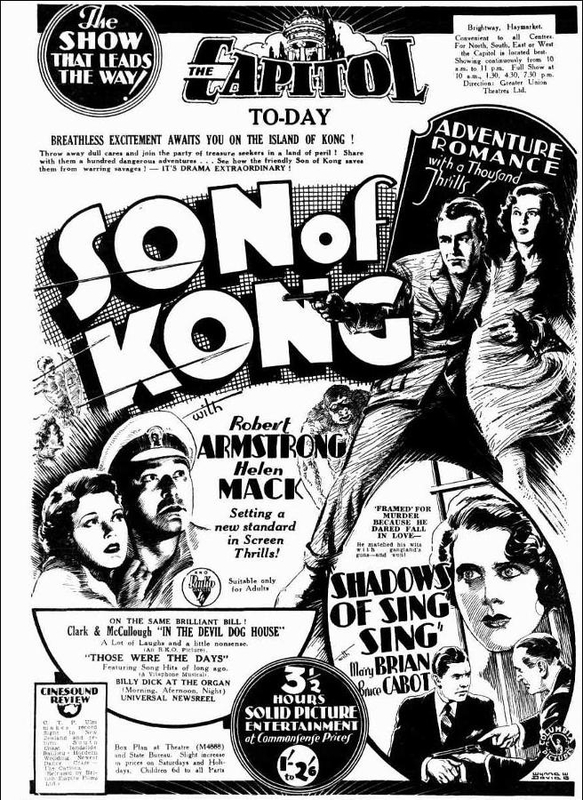 An exciting U.S.A. window card and a 1934 Australian newspaper advertisement, almost ignoring the title character in the image artwork appears above. It makes one ponder what the Simmons long daybill might have looked like. 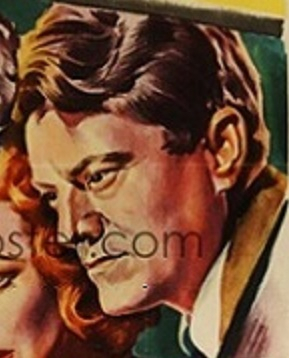 The advisement artwork was designed by Wynne W. Davis who was responsible for designing artwork for many daybills and other promotional paper as well. Still waiting, but not holding out too much hope though that anything will turn up. 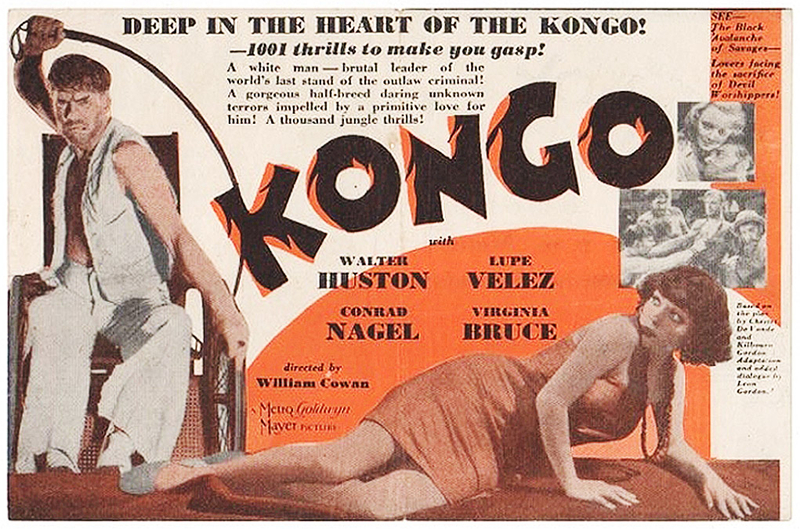 Do we know that Kane was released in 1941 in Oz? 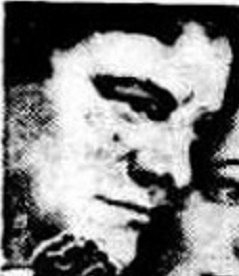 Citizen Kane was indeed released in Australia in 1941, The above earlier posted newspaper advertisement has the hard to read date appearing above the ad from Sydney N.S.W. 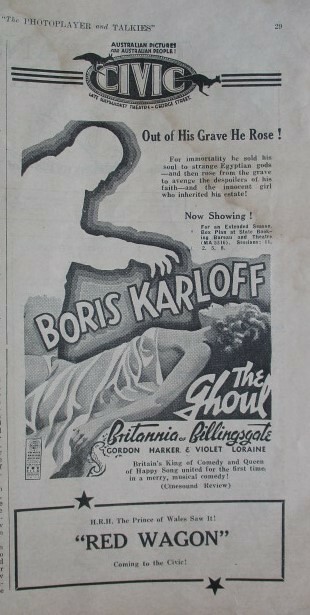 The Daily Mirror newspaper, that was placed on the first day of the Australian release on Friday August 29 1941. 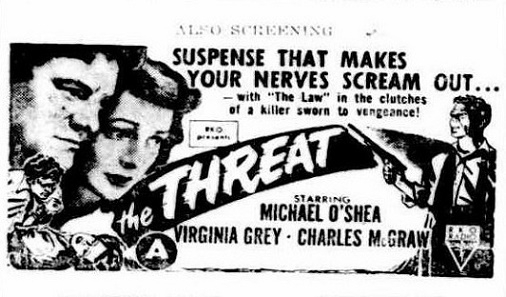 Another amended advertisement altered from the original one, now placed for the Plaza Theatre on September 7 as the film entered it's second week in release. 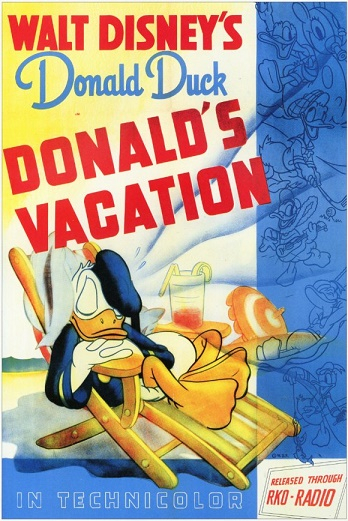 The Walt Disney animated cartoon Donald's Vacation was on the supporting programme. 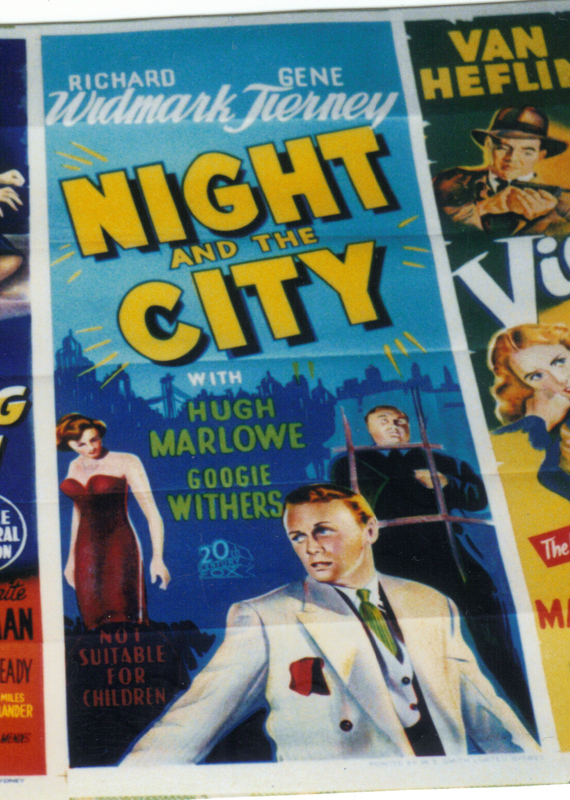 They Drive By Night ( U.S.A. 1940 insert poster) & the original completely different version of They Drive By Night ( U.K.1938 lobby card ). 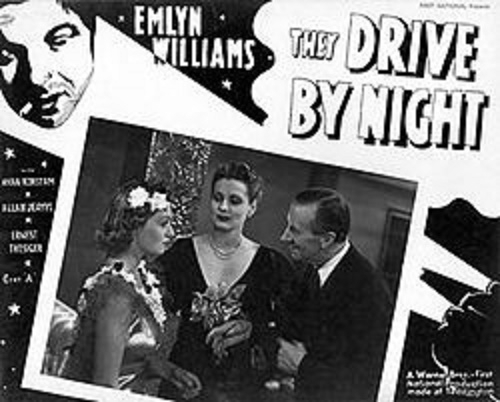 They Drive By Night was a 1938 Bitish film that starred Emlyn Williams that was released in the U.K. by Warner Brothers. In 1940 Warner Brothers released a completely different American film titled They Drive By Night that had no connection to the 1938 film except they had the same title and released by the same distributor. 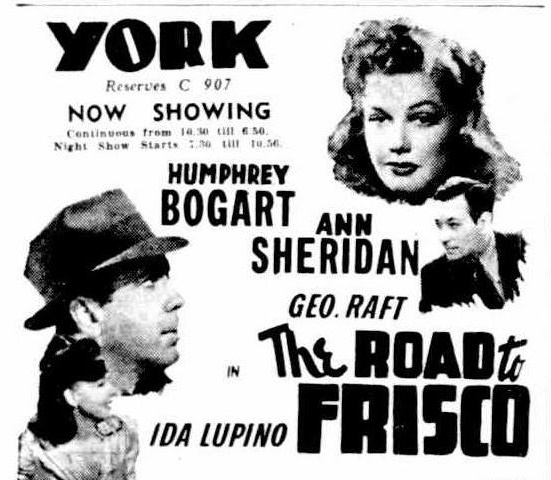 As the U.K. and Australia had already released the British film, the title of the new American film was re-titled The Road To Frisco for some overseas markets including Australia. Another newspaper advertisement placed in either 1944 or 1945 where someone has played around with some ad blocks and elevated Bogie to top billing. Looking at the original U.S. They Drive by Night insert poster and knowing that the original 1940 released re-titled The Road to Frisco daybill would most certainly have been a long daybill, and if the 1940 artwork of other WB films is any indication, including the below All This, And Heaven Too example, if a daybill ever turns up it should be a good one. The Australian 1953 Australian re-release one sheet and extracted from the preceeding 1933 image posted by Ves is what appears to be a one sheet with a very similar design. 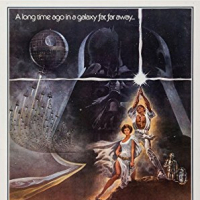 It appears then the original 1933 artwork was copied in 1953. Excellent Sven. I love both images. I had been waiting years for a Baby Face Nelson daybill to turn up and I must say it is much better than I thought it would be. 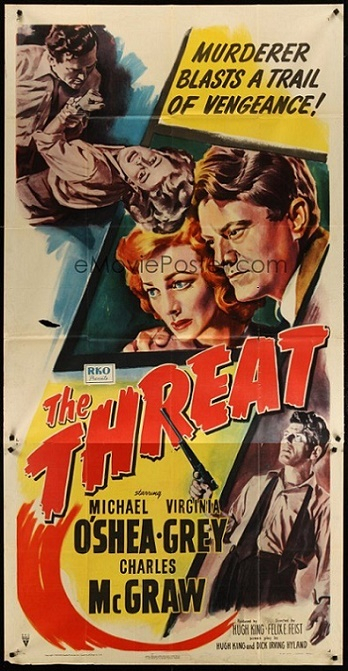 The Threat ( 1949 ). U.S.A. three sheet and an Australian ad block newspaper advertisement. Seeing the images are very similar, I am thinking the missing Simmons RKO daybill may also possibly look somewhat the same . 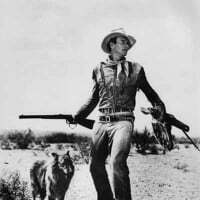 Great image of Charles McGraw holding a gun. In addition to the just posted. 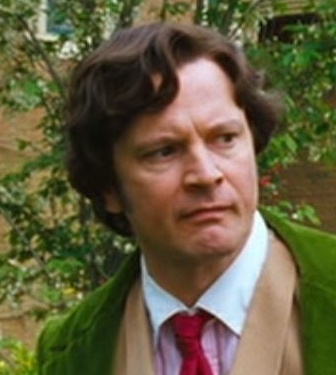 A - Michael O'Shea The Threat U.S. image and B- Michael O'Shea's Australian artist's likeness, but looking amazingly like C- Colin Firth, shown here from Nanny McPhee in 2005. Couldn't let this one pass by without comment. 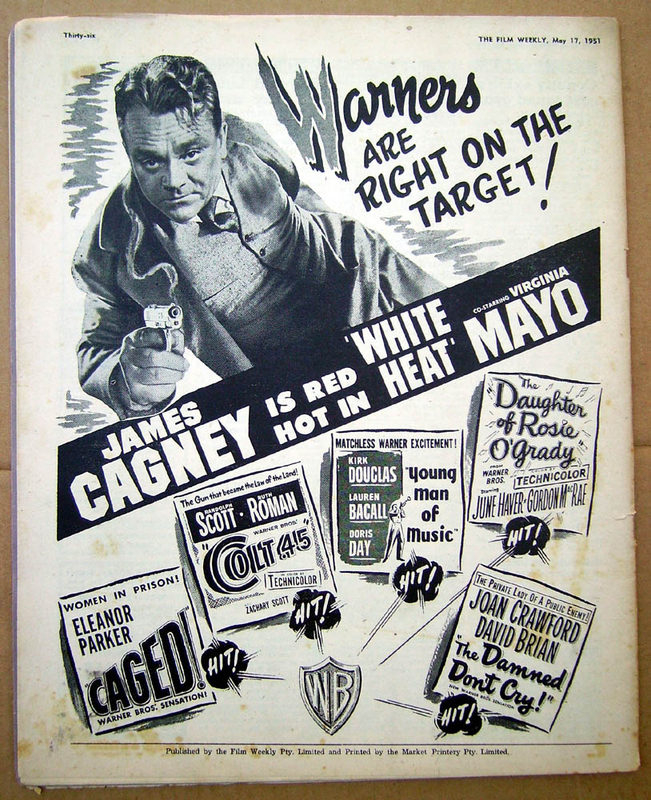 White Heat is one of the few 40's crime daybills I haven't had, I have an image of a photocopy though. 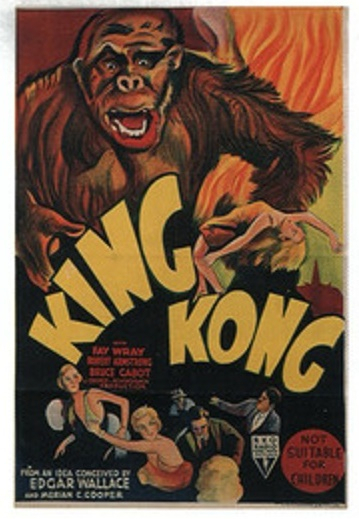 This poster dates from the 50's however, it was released early 1951. Here's Night and the City daybill, the only shot I took - taken with some others when I had a bulk lot on eBay. Nice one Dave! Keep them coming! A certain Canadian collector will love your posts of missing noir daybills ! 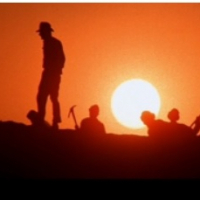 Do you have an image of treasure sierra madre daybill?